The family of front-end parts installed on the car in Russia, including a new front wing concept and turning vanes, were retained for the Japanese GP, and these new parts were accompanied by a new front brake duct fence. The fence features two new fins that protrude out from the vertical fence, both of which take advantage of the reprofiled flow generated by the front wing, guiding it to its destination downstream. At the rear of the car, Ferrari opted to run its lower downforce configuration rear wing, and also tested a new idea for the fully enclosed hole ahead of the rear tyre. The hole, which works in concert with those ahead of it, controls tyre squirt - a phenomenon that’s created by the rotation and deformation of the tyre and impinges on the performance of the diffuser, as airflow is spat off laterally into the diffuser’s path. The floor holes massage the airflow in order that it hits the tyre less abruptly, whilst also creating a sort of air skirt alongside its edge that protects the air that’s pulled through the diffuser. For the Japanese GP, Ferrari opted to extend the most rearward hole all the way across to the vertical floor strake (highlighted in yellow and arrowed). 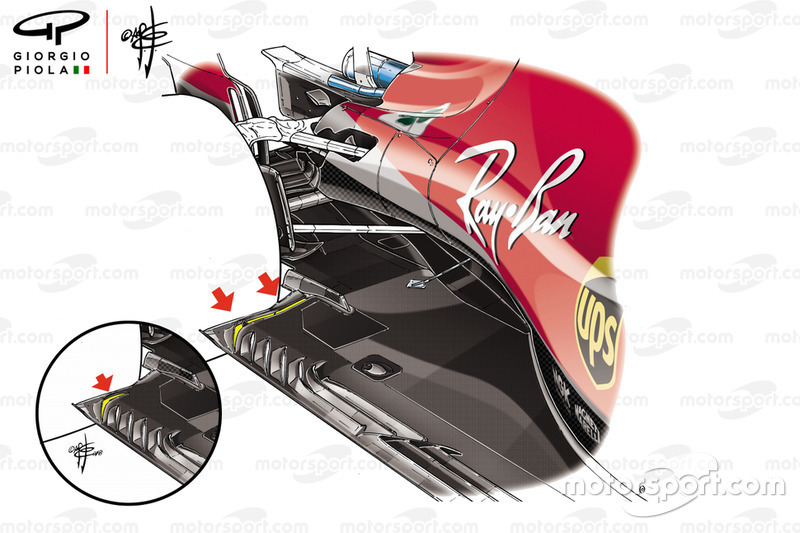 This is the first alteration of its sort from the team since the entire design concept was changed at Silverstone, hinting at an optimisation of the flow path, rather than a full-scale adaptation. The team did not run the new floor beyond first practice but, once it has done a proper analysis of its implications, it could return at a future race if a performance gain is clear.